Morris 2x2 standard LED flat panel light fixture with 3000K color is an office light fixture you may be familiar with but more energy efficient than ever. It's LED array will provide long life and general lighting for many years to come. Designed for installation in conventional suspended ceilings for new construction or retrofit projects. This ultra thin LED troffer will provide long life and general lighting for many years to come without replacing bulbs. Designed for installation in conventional suspended ceilings for new construction or retrofit projects. 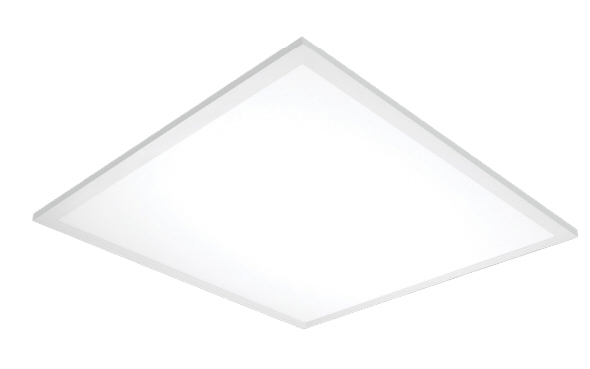 Featuring superior, evenly dispersed lighting that sets the standard in performance for solid state ceiling luminaires. It even has a 0-10 volt dimming onboard standard for many types of electronic dimmers and lighting systems. This is typically used for commercial lighting situations where you want to get maximum energy efficiency and still maintaining light levels throughout the space. There are many choices today in LED, but few meet all the criteria including a very low profile when placed in the ceiling lighting situation. These fit into standard drop ceiling grids that most offices have today, but they can be used in a suspended lighting situation for those of you who want that particular look. Flat panel fixtures have a great look because of the evenness of the light across the face of the light fixture itself. You also get a really good light distribution in all directions contributing to the even lighting you can get in an office space.